News from LMCU: LMCU named among Best and Brightest Companies to Work For in the country! 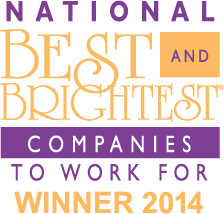 LMCU named among Best and Brightest Companies to Work For in the country! For the past 6 years running, LMCU has made this prestigious list for the West Michigan area. But in 2014, we also won at the national level! This award is based on key metrics like communication, work-life balance, employee education, diversity, recognition, retention and many others. This award recognizes our efforts to build a strong, sustainable business presence without sacrificing employee benefits, growth or wellbeing. LMCU is currently hiring across many different departments. If you or someone you know is looking for a challenging, rewarding career position, visit LMCU.org/careers.